Bonsai. A bonsai is a perfected miniature tree, maintained well and with a lot of perseverance. 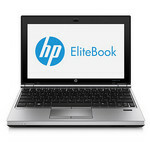 Is HP's smallest EliteBook also perfect in form and devised with attention to detail? Among the included HP-branded application is the HP ProtectTools suite, which sets up drive encryption, password management, biometrics controls (both fingerprint and face recognition), and smart-card functions. Also included is the Computrace theft-recovery system, although a separate subscription is required to activate it. Less impressive is the HP SoftPaq Manager for installing HP-specific updates to the system. Its bewildering interface -- vintage Windows 2000 -- left me wondering whether or not I had installed certain updates. With any luck, in a managed fleet, the end-user won't ever have to touch it. The HP EliteBook 2170p is a well-designed business ultraportable with a terrific keyboard and a solidly resilient chassis. Battery life is a little short for a system designed for portability, but 2170p has the computing power to serve as your primary PC plugged in. It's a reasonably priced ultraportable whose compact size and good feature set make it worthy of consideration. At $1,099, the HP EliteBook 2170p offers a durable build and above-average battery life in a lightweight design that's easy for road warriors to carry. Our chief complaint is the liliputian touchpad, which makes executing Windows 8 gestures somewhat of a pain. In this price range, we prefer the Lenovo ThinkPad X230, which, though slightly larger and heavier, costs about $100 less and offers longer battery life, a brighter display, and better pointing stick. The EliteBook line is long overdue for an update. Today, when placed alongside modern Ultrabooks, the 2170p looks and feels ancient. It’s thick, it’s bulky, and it lacks a responsive solid-state drive. These traits make it a poor alternative to any number of consumer Ultrabooks on the market. Even business users have a better option in the Lenovo X230, which beats the 2170p in almost every category. Business Class, But Business Savvy? Expectations are strange things. As reviewers we try to be unbiased, but we aren't really immune to being excited about or nervous about a product coming in for review. Consequently, a promising product that turns out to be nearly everything you hoped for can get a fairly glowing review, but a promising product that falls short of expectations can quickly turn into a diplomatic exercise. Positive: Features large notebook in a compact design; docking connector identical to the working lines P / W / B; comfortable keyboard with backlight. Negative: Noisy hard drive; the display could be brighter.